Since I’m receiving at least a couple of questions each day about my tutorial video on Converting Computer ATX Power Supply to Lab Bench Power Supply and I can’t answer them all, I thought it’s time to answer to the most frequently asked questions. If you think that I forgot to highlight some important question(s), you can write that in the comments below. What are the values of current limiting resistors for LEDs? Why would you need two switches? How can I know where to connect dummy load resistors(to +5V rail or to +12V rail)? Is it nessesary to keep all the wires? Why would you need those dummy load resistors? What if I can’t find these dummy load resistor values? I can’t find brown (3.3V sense) wire in my power supply – what should I do? After switching on, my PSU don’t want to switch off from a small(between POWER_ON and GND) switch. Why would anyone need -5V and -12V rails? Where to connect POWER_GOOD (gray wire)? I can’t get rated current on 12V rail. Why? Why waste all that heatshrink? Short answer: small 470Ω-1kΩ (whichever you can find) resistor. The smaller resistor value – the higher LED brightness will be. First mains switch switches mains power on and off. The same as if you would plug in or pull out PSU in and from power outlet. This switch is not mandatory. ATX power supplies are designed to be plugged in to mains indefinitely. Only exception if you walk out for a long time, you’d better pull the plug. The second low voltage and low current switch usually is mandatory. You see, ATX power supplies are designed to be switched on by POWER_ON signal from computer’s main board after it already plugged in to mains. Now main board needs to get some power to operate in standby mode and to send POWER_ON signal to power supply, to swith it on. Because of that all ATX PSUs have not one but TWO SEPARATE power supplies inside. One is the main power supply, which can give you all those huge currents and different voltages, and the other is low-power 5V only stand-by power supply which can give a couple of amps to main board while main power supply is off. So, to switch it on correctly we need to plug it in to mains first, and only then use small switch to connect POWER_ON to GND. If your PSU was made before year 2000 then most likely you need to connect resistors between +5V rail and GND. If PSU was made in year 2000 or later then resistors should go between +12V rail and GND. There might be some exceptions to those rules. You should pay close attention to power supplies that were made between 1999 and 2001. There’s two standards: old one – ATX, and a new one ATX12V. Read carefully sticker on your power supply to determine which standard it conforms to. No, it is not nessesary to keep all those wires. As a rule of thumb each wire that goes to Molex or SATA power connector can carry about 3A. you can calculate how many wires you need to keep for each rail by dividing each rail’s maximum current by 3A. And for GND take combined number of wires for all the rails (it’s in case that you might be using all the output rails in parallel). As I said in the video, ATX power supply is a Switch-Mode Power Supply. And, unlike linear, switch-mode PSU require some output load to operate properly (or to operate at all). Some ATX power supplies already have a small dummy load resistors inside, so they can work without load simply by connecting POWER_ON wire to GND. But there’s a catch! Even if power supply has dummy load resistor built-in, it might not give you a stable output voltages. Without external high-power dummy load resistor, PSU’s output voltage without load can substantially differ from output voltage with some load applied. In some extreme cases you can get up to 2V difference. 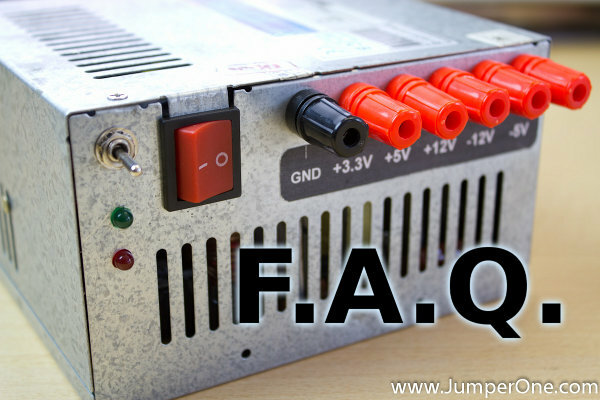 You need to decide whether you need a stable output voltage or not, depending on what you will be using this PSU for. For example light bulb, or car stereo don’t need stable output voltage. But if to use it as a lab bench power supply, it is better to have a nice steady output. For more information google for “Power Supply Load Regulation”. First read answer to previous question. You can take a bit higher resistor values(but not lower). Let’s say if you don’t have 10 Ohms resistor, you can take 20 or 30 Ohms. Or combine some resistors in series or parallel(if you don’t know how to do that, google is your friend!). But always take into account how much power will be dissipated on each resistor! It should be about two or three times less than resistor is rated for. Nothing. If your PSU doesn’t have that wire, then you don’t need it. In that case connect small 10k resistor across POWER_ON and +5V_STANDBY. -5V and -12V rails is actually might be very useful in many cases. For example you can get 24V output between -12V and +12V rails or 8.3V between -5V and +3.3V rails, etc. Or supply dual (-5V)-GND-(+5V) rails to power an operational amplifier (or (-12V)-GND-(+12V)). But remember that the maximum output current will be limited to the current that -5V or -12V can supply(usually about a couple of amps). You can cut POWER_GOOD wire off. You don’t need that wire for a bench power supply. Since after turning on a power supply, voltage across outputs cannot rise momentarily, it’ll take some time(like 200 milliseconds, or so) to settle down at predetermined level. And because of that POWER_GOOD signal is used by computer mainboards to determine whether voltages are OK an if CPU and other peripherals can start to draw power. This could be because of cross-regulation issues or maybe you have a cheap and crappy power supply. If it’s not latter, than you might try to put some dummy load on both +5V AND +12V rails. For example, you can’t get nothing even close to rated current from +12V rail. In this case you need to put some load across +5V rail. And vice-versa, if you can’t get current you need from +5V rail, then put some load across +12V rail. I can’t tell you how much load you might need, it depends on concrete power supply. You might want to start with small load and work your way up. Heat shrink around mains wires is mandatory, because you can’t mix high-voltage wires with low-voltage ones. It looks good on video. If PSU would be subjected to vibration, heat shrink would protect wires from sharp heatsink edges. Have you seen heat-shrunk salami? No?